This groundbreaking book contributes to, and refocuses, public debates about the incorporation of plural approaches into the English legal system. 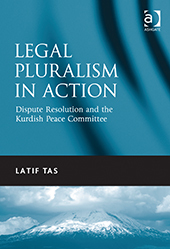 The book specifically advances the recent, largely theoretical, discussions of Sharia legal practice by examining a secular method of dispute resolution as practised by the Kurdish Peace Committee in London. Following migration to the West, many Kurds still adhere to traditional values and norms. Building on these, they have adapted their customary legal practices to create unofficial legal courts and other forms of legal hybridisation. These practical solutions to the challenges of a pluralistic life are seen by Kurdish communities in the UK as applicable not only to British and transnational daily life, but also as a training ground for institutions in a possible future Kurdish state. The study provides a substantive evidence base using extensive ethnographic data about the workings of the Kurdish Peace Committee, examining detailed case studies in the context of the customs and practices of the Kurdish community. Based on an ethnographic and interdisciplinary approach, this book will be of interest to policy makers, socio-legal professionals, students and scholars of legal anthropology, ethnic minority law, transnationalism, diaspora, Kurdish, Turkish and Middle Eastern studies. Contents: Introduction; Legal pluralism; Kurds in Turkey: the historical background; Kurds in the UK: settlements and processing of their needs; Marriage, rituals and conflicts in Kurdish society; Business and criminal disputes and their customary solutions; Concluding thoughts; Glossary; Bibliography; Index.